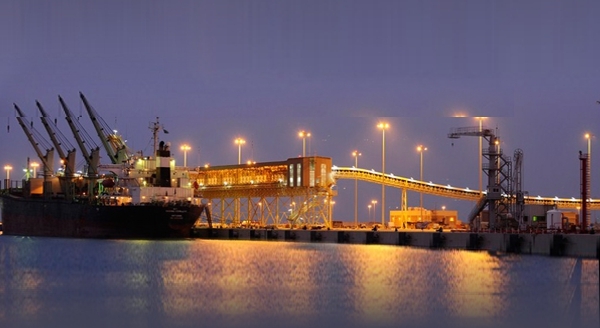 The new port under construction at Ras Al Khair will accommodate vessels of up to 70,000 dead weight tons. The port, initially planned as part of Ma’aden’s Ras Al-Khair scheme, will also cater to Ma’aden’s Fertiliser and Aluminium Complexes in addition to other industries, which will be developed in the Ras Al-Khair area. The project requires the construction of three huge reinforced concrete silos 59.59 m in height, 32 m diameter, and 40 cm in thickness. The concrete for each silo has to be poured continuously around the clock for an average period about three weeks. The slip-formed concrete placement methodology was another major challenge, taking into consideration the heights of the silo and the high wind speeds that the area normally witnesses. Pure plastering and pure retarding admixtures were used to control the slump retention and the setting time, respectively. To control slump, avoid excessive slump loss and ensure placing within the time limit, truck mixers were initially loaded with 3 to 4 cubic meters per delivery. The loads were gradually increased as the rate of pouring of concrete accelerated. The batch plants were operated continuously for 24 hours, 7 days a week. The number of operating manpower was increased to run two shifts and highly experienced concrete technicians were present 24 hours, all to ensure a smooth trouble-free delivery and pouring process. Concrete pumps were cleaned more frequently to avoid any sudden blockages.